Recently James Woods was banned from Twitter. Why? Because he stood his ground against conservative censorship. After being released from Twitter jail, Woods is back to doing what he does best, which is exposing the hypocrisy and double standards of the left. Good to have you back, James. 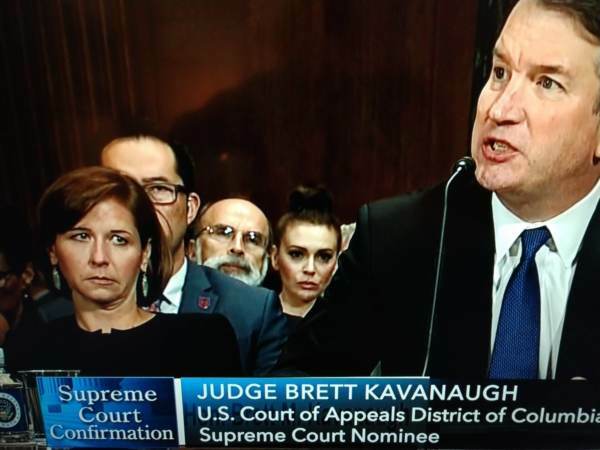 Alyssa Milano made a major attention grabbing move when she attended the Kavanaugh-Ford hearing on September 27, 2018. Here is a screen grab of it. If you know James Woods and how he rolls on Twitter, you know this was too much for him to resist. He posted an image that rolled all so much Milano hypocrisy into one tweet. See when it comes to the sexual allegations against Bill Clinton, there is a lot of documentation of Slick Willie abusing women in the work place. Monica Lewinsky, anyone? This is very different from the allegations against President Trump and Justice Kavanaugh. Last Thursday Milano appeared on CNN with Chris Cuomo and admitted that the allegations against Bill Clinton should have been investigated even more. Even far left Alyssa Milano knows Bill Clinton got off easy. It is hard to get much more hypocritical than this delusional, faded star. How does she not even consider these tweets are going to blow up in her face? While she is a champion of women’s rights, she takes to Twitter to say “I love you” to one of the most famed woman abusers of all-time.